Note: I just received the bike path counts from Madison, and the numbers at every count station appear to be up in 2011 from 2010, which runs counter what the ACS data shows. I also got the crash data for Milwaukee and Madison. I will publish those results in a post tomorrow. The US Census Dept. just released the results of the 2011 American Community Survey, and the number of people reporting they biked to work in Madison dropped from 6% to 4.7%. Milwaukee continued its trend of small steady increases in the number of people who bike to work. Since the 2000 Census, Milwaukee has seen a 227% increase. Over that same period, Madison has seen a 147% increase, even though the number of people riding to work actually decreased from 2010 to 2011. The image to the right shows the actual question on the American Community Survey, which only asks about one week, not people’s general preferred way to get to work. You can see by the way the question is asked in the survey that the weather could play a dramatic role in shifting the results. Years in which LAST WEEK was cold and wet the numbers would be way down, and years in which the weather was pleasant LAST WEEK would higher numbers of people checking the box for Bicycle. The chart below shows the data for Milwaukee and Madison since the 2000 Census. I attribute Milwaukee’s big increases in 2007 and 2008 to the 30 miles of new bike lanes they added those years. In 2007 Milwaukee added 30 miles and repainted them in the Spring of 2008. Going from 15 miles to 45 miles of bike lanes was really noticeable and combined with good weather, could have caused the big jump. Those bike lanes did fade quite a bit after that because they were not maintained. In recent years Milwaukee purchased an new long line paint truck, and they have done a better job of maintaining bike lanes. They have also continued to add them as part of regular road resurfacing projects. I am not sure why Madison showed a big drop last year, but I included journey to work data for motorcycles as well because one could assume that would be similarly affected by bad weather. Note that the number of people who reported they used a motorcycle to get to work in that week in 2011 dropped even more than the bike commuting mode share. We don’t know exactly when people are surveyed, but based on the drop in motorcycle commuters, I suspect Madison had a bad weather week. A much better way to look at trends in bicycle use is by doing electronic bicycle counts. Madison has counters installed in some of their bike paths and on the University Avenue contra-flow bike lane. 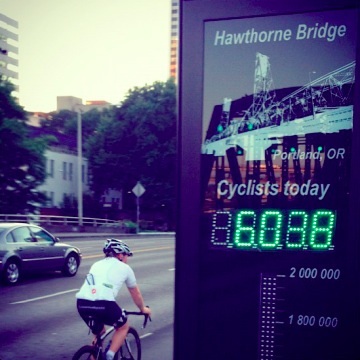 Portland recently installed a fancy new counter with a visual display on the Hawthorne Bridge. It records more than 7,000 people riding bicycles across the bridge every day. Copenhagen is famous for their visual bike counters, which record more bikes than cars on the roads where they are installed. Very cool Casey, who is “we”? Before we get one of those cool counters for KK, we need to move the bike lanes next to the curb and buffer them with the parked cars. We could do that on a trail basis and create a protected bike lane just by repainting the lines, maybe include a few bollards to help people figure out where to park. That said, it will be interesting to see what the new counters on the Southwest and Campus Drive paths show for traffic counts. I have considered statistical margins of error and even perhaps “regression to the mean” as an answer. I emailed Arthur Ross to get the bike count numbers, but have not heard back from him. It may be coincidence, but Portland bike count numbers are up almost exactly the same as their ACS journey to work data. I would like to see if Madison numbers tell a different story than their Census data. That is why I mentioned counts in the blog post, they are a much more reliable way to see trends. I misread the ACS margin of error as a standard error, but the recent differences still are likely to be due to sampling variability — the difference between two one-year estimates has a higher MOE than the estimates themselves. I agree about the bike counts providing a better indicator of short-term trends –please do post them if/when you get them! Lesson to take away from all of this? If you get the ACS survey, LIE! I’m disappointed in this headline, which basically assumes the data herein is relevant. This must be the stupidest way of tracking bicycle mode share I’ve ever heard. Ask one question that applies to less than 2% of the year, don’t account for any variables and call it good? These numbers are essentially meaningless. Better headline: Is bike commuting actually down in Madison and up in Milwaukee? As I mentioned in the blog post, bicycle counts are a much better way to measure use. Perhaps you didn’t see my other comment, but I did try to get the count numbers for Madison, but Arthur has not gotten back to me yet. I will publish those numbers as soon as I get them. That said, the ACS gives us an apples to apples way to look at different cities, given most places don’t do regular counts. I don’t think it is meaningless, the trends over time (since 2000) are indicative of real trends, even if they don’t match up exactly or from year to year. But the statistically small population in the ACS certainly means we need to look at other data to get a more accurate picture of real bicycle use. I do regularly follow the statistics that the Bike Fed posts, so I have seen other articles that indicate positive trends. I’m not worried about the state of cycling (thanks, in part, to the work you all do). I just think the headline is awfully misleading, representing conclusive facts (cycling in Madison is down), when that isn’t the case (the general trend is up). As far as the ACS is concerned, if we want to analyze long-term trends we should keep this question in the survey (if only so we have this particular long term trend) but start asking other questions and start tracking those trends as well (once the trend is long enough to start caring) with the eventual goal of phasing out the first question. Changing the question on future surveys is not a bad idea. It is definitely something we could suggest to the national advocacy groups. I have no idea how difficult that might be. I do know that the House tried to completely eliminate the ACS. From what I read, census goes against TEA Party principles, so they were working to get rid of it. I didn’t follow that too closely, but I think that effort failed. I will bring the change in question up to the national groups. Thanks for the idea. Counters that display the number! Love that idea. I can’t imagine the proud feelings that would occur being a rider and seeing that number increase weekly/monthly……etc. Of course, the truth can hurt too. From my understanding, the ACS survey data for commute mode split is useful – not for the figure it gives for a particular year, but to identify long term trends. The US Census Bureau has asked the identical question in its survey for something like 20 years (Dave – please correct me if I’m wrong about that time interval). I don’t believe there is any other nationwide data easily available going back anywhere near that far back. Yes, Tiny Little Fish, we all agree the particular ACS question that is the focus of this blog post is flawed. No one is suggesting we abandon all the efforts being made to create more accurate bicycle mode split data in cities across the country. But it is very powerful to have evidence that bicycle commute mode split (which probably has a positive correlation to overall bicycle mode split) has generally been following an upward trend over a very long period of time using data from an objective government agency’s survey (that is, from a non-bicycle-advocacy org). It validates the trends seen in data from all the other counts taken by government and advocacy groups. Maybe Dave could wave chosen a different headline, but the ACS data is certainly not ” essentially meaningless”. When someone prominent in your local government tries to discount the trends indicated by your local bike counts, correlation to ACS data is a pretty powerful rebuttal. Bob, that is essentially why I included the long term data since 2000. And over time, Madison is still up 140% or so. I think that remains a good number to use. If over the long term we saw things decline, that would also tell us something. That said, I certainly agree that actual bike counts are best, both single day peak hour counts and even better, those done with permanent counters that count 365/24. I agree with Tom Bozzo: if you’re going to use ACS, stick with the multi-year estimates. The year to year variability of the yearly ACS estimates–on almost any measure the ACS includes—mean nothing. I want to add a little perspective to the 2007/2008 bicycle count numbers. Those were banner years for bicycle commuting across the country. I believe 2008 was the first year that gas prices hit $4.00 per gallon. At the time it was a big shock to motorists. I live in Minneapolis and that year we saw interest in bicycle commuting classes peak and car buyers shifted from big trucks to fuel efficient vehicles. Today gasoline prices hover near $4.00 again, but they have been bouncing near that price regularly, so the impact isn’t the same. Excellent point Doug. That sticker shock has worn off. Hard to believe people have just accepted $50 weekly trips to the gas pump, but I expect we won’t see the same reaction from people until it pops over the $5/gallon price. I do hope that bike riders continue to use everything that is available so that Milwaukee will be a “great biking community”. ‘As long as safety laws are remembered.